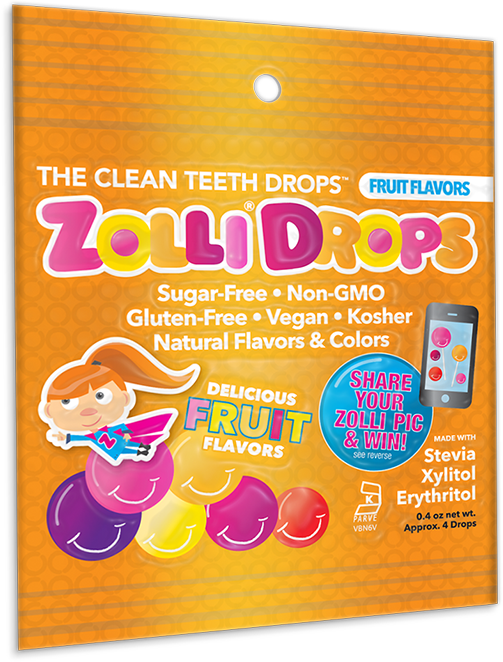 Born from the imagination of Kidpreneur Alina Morse, Zollipops®, Zolli® Drops, and Zaffi® Taffy are delicious natural treats supercharged with Xylitol, Erythritol, Stevia and other smile friendly natural ingredients that are actually good for your teeth! Our treats are a favorite among dentists, teachers and families and perfect for lunches, parties and as healthy rewards or prizes. Zollipops are sugar free, non-GMO, gluten free, dairy-free, vegan, natural, kosher and mom approved! Each pack comes in a convenient re-sealable pouch. Known as The After You Eat Treat, enjoy one after every meal, up to three per day, for a cleaner, healthier smile. The smart, yummy treat for your teeth. SAME NATURAL & VEGAN INGREDIENTS AS ZOLLIPOPS, SANS THE STICK! Adults asked and we answered – they wanted all the taste, flavor and fun of Zollipops but without the stick. So Alina, the Lollipop Girl, invented Zolli Drops – the delicious and natural treat that helps you clean your teeth and achieve a healthy smile. 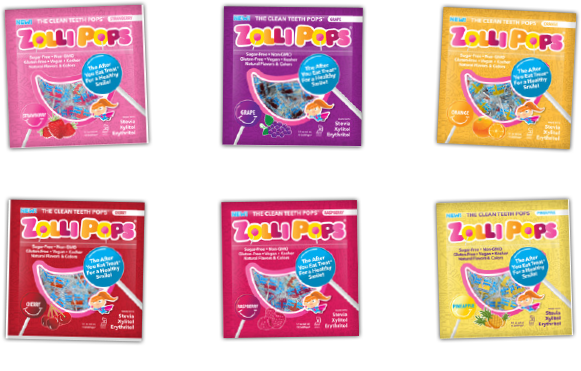 Available in mint and fruit flavors, Zolli Drops are made from the same amazing ingredients as Zollipops, but in a fun drop! A favorite with dentists and seniors, Zolli Drops are perfect for dry mouth. Saliva helps keep our smile healthy and Zolli Drops are a fun, delicious way to help stimulate saliva production and help keep you smiling for years to come. Keep a few in your purse or pocket to share with friends and family, and enjoy after every meal. Zaffi Taffy are sugar free, gluten free, dairy-free, vegan, natural, kosher and Mom approved! Each pack comes in a convenient re-sealable pouch. Zaffi is the perfect After You Eat Treat, enjoy one after every meal, up to three per day, for a cleaner, healthier smile! It’s the smartest, yummiest taffy on Earth.